For referees the initial rounds of a mixed ability shiai can often be extremely challenging. There is a degree of subjectivity in the way we judge what is and what is not ippon and the level of severity with which we apply the rules will vary according to the age and experience level of the competitors. With competitions that are open to both kyu and dan ranked players, outcomes are often surprising. Junior kenshi do not do what is expected of them, or they react to attacks in a way that more experienced players would not, so you often see skilled shiaisha having a hard time because when they go for what should be an open target, the less experienced opponent’s men is protected by a raised shinai when an experienced player would still be in chudan. The most challenging aspect is when the newbie is gamely slugging away and hitting the target, but without correct footwork or ki-ken-tai-itchi. 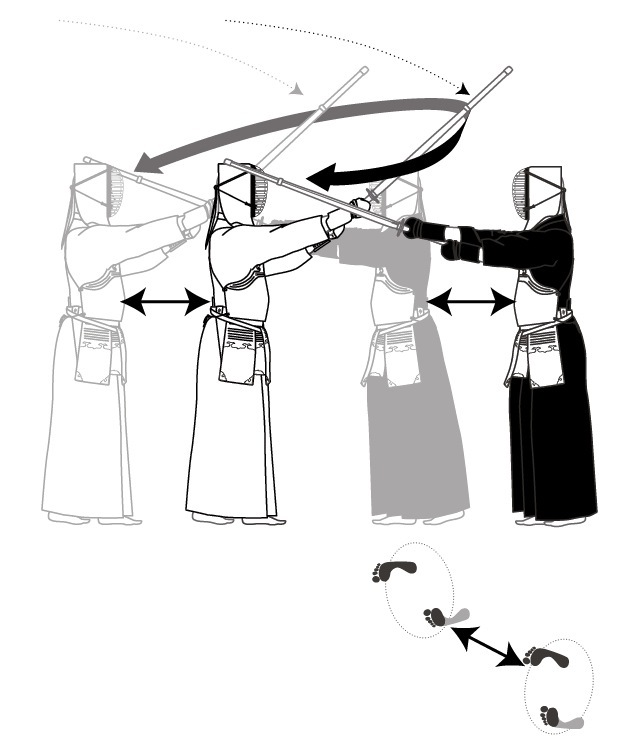 None of these incorrect strikes can be counted within the rules of kendo shiai, but they cause frustration and confusion for the competitor and the audience. It is difficult to create hard and fast rules on grade level. I have seen kyu grades produce highly skilled kendo and dan grades who have not quite got their basics right, but generally, more experienced players tend to have a more established level of basic kendo technique. Whilst not necessarily guaranteeing the highest level of kendo, these mixed ability events can be highly enjoyable and offer all dojo members a great bonding opportunity. 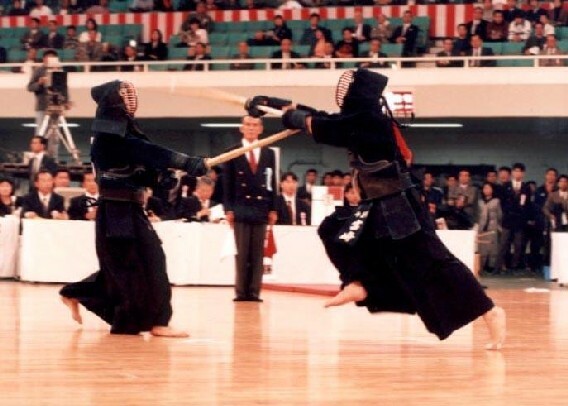 The standard of kendo invariably improves as each taikai runs its course and the players who make it to the last eight and upwards normally demonstrate that correct technique is the most effective. There are of course competition options other than sanbon shiai. Comparing how well players demonstrate kiri-kaeshi and a range of basic techniques against a motodachi is one approach. This is frequently used for the younger competitors in children’s competitions and is a great way to encourage competitive spirit without building a defensive attitude that might limit kendo development. As in all things, common sense is probably the way forward. For competitors who are still building their kendo skill set, if they can come away from a taikai with the inspiration to improve, it has been a valuable experience. The key point to remember is that shiai is the tip of the iceberg that we build in our regular keiko in the dojo. One of the most common errors that I see from beginners, and in some cases from more experienced kenshi, is the habit of putting an extra step into their approach and attack. What I mean is that they start outside of striking distance; take a step towards their opponent, take another step whilst raising the shinai and another one when bringing it down. This is often compounded by using walking footwork, alternating the forward foot in in this three stage step, raise, and strike routine. The correct action is of course to step into range maintaining chudan kamae then raise and lower the shinai in a continuous movement, simultaneously taking a second step to strike the target. This sound simple but some people find it difficult, particularly if they have become used to attacking in a one, two, three rhythm. Raising the shinai whilst you are outside striking distance gives your opponent early warning of your intention. 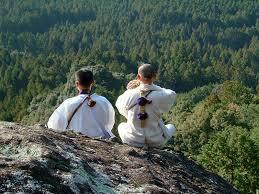 It also leaves you open to tsuki and dou, particularly if you spend a long time with your shinai raised. It also means that your technique, should you manage to strike the target is likely not to have correct ki-ken-tai-itchi, as it is difficult to coordinate hand and foot movement. 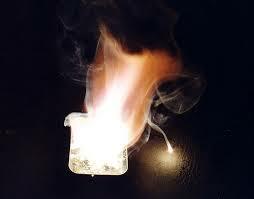 There are numerous ways however to correct this fault. A good start is to practice suburi, concentrating on making the up and down movement in the timing of one (ichibyoshi). You can also practise men drills stepping into your own uchima distance without lowering or lifting the point of your shinai and then raise it as you push off from the left foot and bring it sharply down on your opponent’s men as your right foot hits the floor. You should ensure that before pushing off you bring your left foot up to the correct position and that the ball of the foot has strong contact with the floor. Once you succeed with this drill you can develop it using smaller strikes just powered by your forward movement and tenouchi. Then with your partner’s co-operation you can work creating and breaking pressure to build a basis for debana men. If you do suffer from the “one, two, three” syndrome, it is worth correcting the habit as early in your kendo career as you can. Having good basics makes it much easier to learn advanced techniques. I am back from a weekend of kendo. On Saturday I ran a coaching session for the British Kendo Squad and on Sunday I refereed The British Open Championships. It was an interesting combination of events as the second day allowed everyone to work on putting theory into practice. I have written about sae on a number of occasions. This term describes the snap or sharpness necessary to turn a strike into a successful yuko datotsu. This and seme were the themes of the squad training session. Whilst we looked at a number of shikake and oji techniques, we paid particular attention to both how we made the opportunity and how we finished each attack. 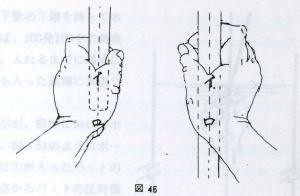 Sae in theory is a product of tenouchi, (the inside of the hands), or the way you complete the cut by squeezing the tsuka of the shinai as it makes contract with the target. In practice the path of the cut also has to be correct and ki-ken-tai-itchi has to bring all the elements of footwork, posture and kiai together at the exact point of striking the target. Sae is not something than can be applied as an afterthought. If your hands are in the correct position throughout the strike then it is simply a matter of squeezing with the little and ring fingers of both hands on the point of impact. If they are not and for instance your right hand is holding too strongly, then regardless of whether or not you squeeze the shinai, it will not result in ippon. Chiba sensei talks about making tenouchi for men once the shinai is at chin height. The concept is to hit the target and then squeeze after, so that you strike with full force and complete the technique sharply just below the point of impact. This is not as aggressive as it sounds, because if the use of shoulders, elbows and wrists are correct, the strike will be quick and sharp rather than heavy. At yesterday’s taikai we saw varying levels of sae. There were many long encho where both fighters made numerous strikes, but few were sharp enough to make the referees raise their flags. At the end of the day we were presenting prizes and cleaning the hall at the same time. There was of course some enjoyable kendo. Mr Yamazaki, from Hokkaido University took first place, demonstrating my sae theory with some explosive techniques, including an excellent tsuki in the semi-final. I was also delighted that two of our regular Mumeishi students Alex Heyworth and Alan Thompson respectively took second and third place medals. On a completely different subject, I had a Skype chat with a Japanese kendo friend who recently returned home after many years in the UK. He visited the Shudokan in Osaka and mentioned that he had to wait 45 minutes for keiko with a hachidan sensei. Nothing changes!